Firmly standing after strong winds. Passed the test! Still believing that the storm had been blown away; after all everyone kept around me kept saying that “the weather changes rather quickly here”, I drove to Amarillo to hang out at a coffee shop. Later on that evening I heard some loud noises coming from outside and I asked what was that? The wind! – replied Dan. The first thing that came to mind was the cliff-side meandering road in the canyon. I must admit that I got weary about driving back to my campsite. Then it dawned to me that this was the first test for the tent and to my tent pitching skills; I had no idea if it would be still standing when I arrived at the site. 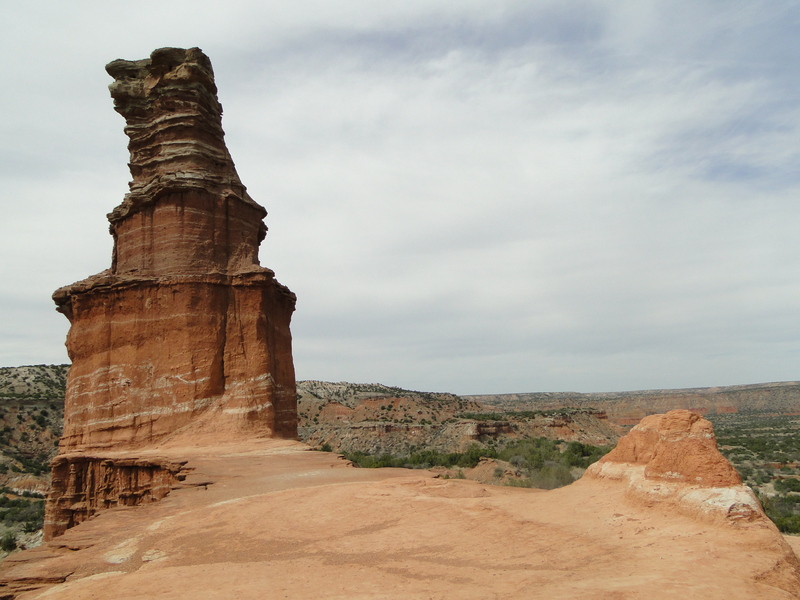 I drove back to the canyon with the reassurance that if the windy conditions on the road turned out to be threatening and I wanted to turn around or if my tent had been blown away, I had a place to spend the night in Amarillo. The good thing about driving by a cliff at night is that you can’t see how far down would you fall. As I was the only driver on the road from beginning to end of the trip that night, which pretty much told me that I should not be on the road, I was able to go as slow as I wanted. I made it safely and to my relief the tent was firmly standing! It had passed the test! I went to sleep that night at the sound of the whistling wind thinking how cool this was. I woke up a couple of hours later chocking in a dust filled tent. 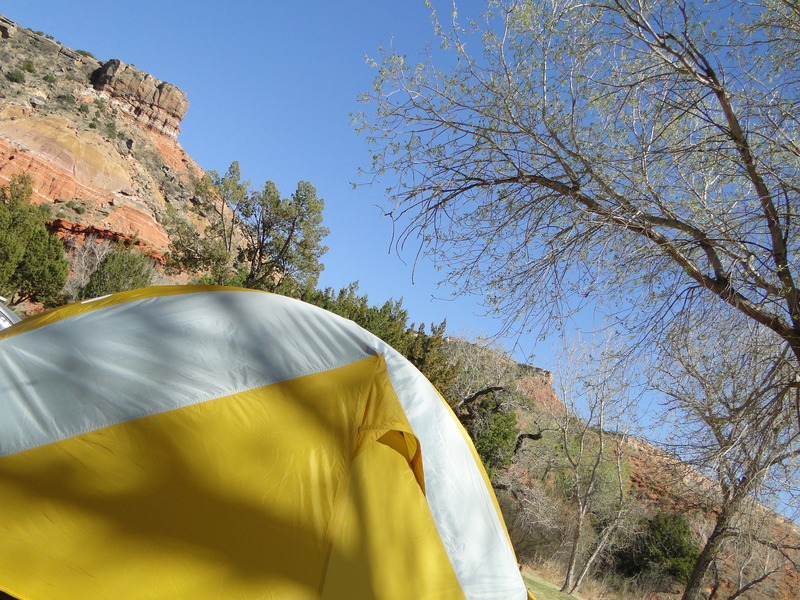 The thin sand dust had filtered through my “breathable” tent and had made breathing quite difficult. Just in case a rattlesnake was hanging out by the tent with her buddies, with my headlights on I sat on the table outside for a while. It was better outside! The storm seemed to have passed. With the tent open to circulate the sand dust out, I kept an eye in the surroundings just to make sure no reptile or other creatures would invite themselves in for the night. I went back to sleep and woke up in the morning to a beautiful, sunny day. I was ready to hike to the highlight of the park: the must-see Lighthouse. The Lighthouse Trail is classified as moderate according to the park’s brochures. And it is! Except for some sections mainly at the end when you reach the formation. I noticed that most of the tourists who made it to the base were just snapping pictures from there before turning around to head back to the trailhead. 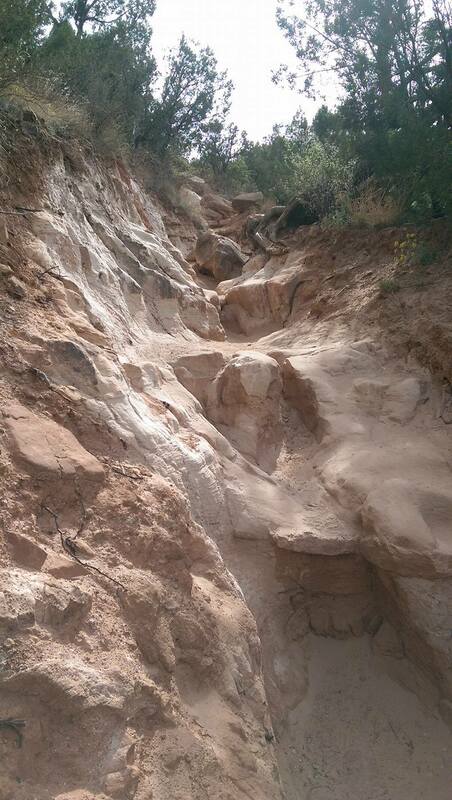 The trail from that point on, if you want to climb up onto the formation is quite difficult. The other thing about this trail is that although it is moderate for most part, depending on the temperature and wind conditions can become difficult. It certainly was the case that day as the strong winds from the storm weren’t completely gone yet. Others, the majority on that particular day, just read the trail information and warning signs posted at the trailhead from their cars and drove away. At the same time that one of the park’s brochures describing the the trails invites visitors to not “miss the park’s most popular trail to the iconic Lighthouse formation”, it also warns that “most heat-related injuries and deaths to people and pets occur on this trail”. 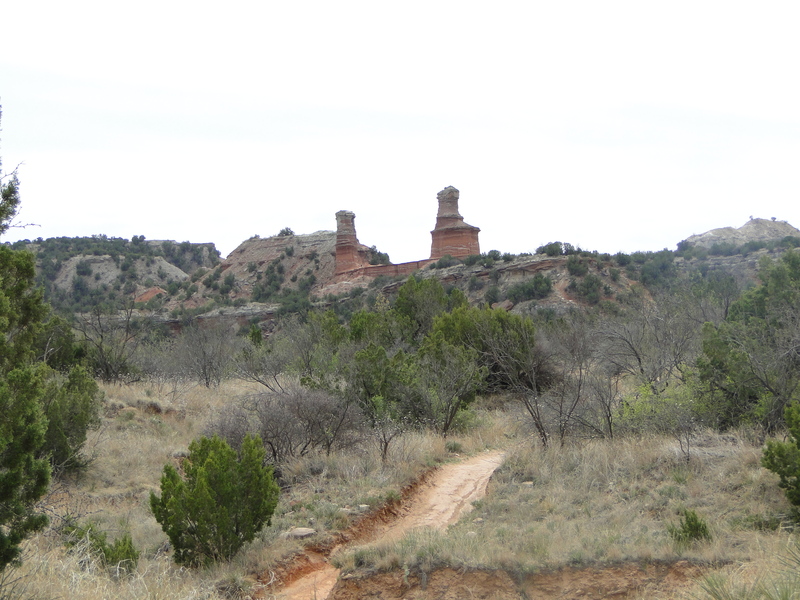 The Lighthouse is the “prima donna” of the Palo Duro Canyon State Park. However, one cannot see her before hiking a considerable portion of the trail. And yes, when it comes to sight, it looks just like a majestic lighthouse in the horizon. After resting at the base of the formation for a few minutes, where I chatted with a couple from Utah who told me that that was as far as they would go because of their age and physical preparedness, I resumed my hike to the top. Only a young couple sat up on the second and highest plateau. The views from there were magnificent, while the wind was treacherously strong. I remained laying on the mesa for a while watching the fast moving white clouds rolling above me. 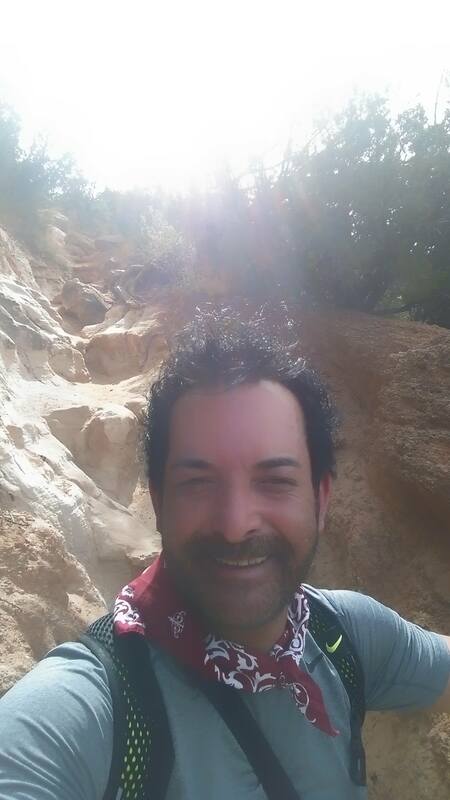 My feet hurt and I knew I had 2.72 miles to hike back to the trailhead. For now I was just going to enjoy the view, hoping that the wind would not throw me down the canyon.